Welcome back to another creative installment and a special welcome to all my new followers. I hope you gain some inspiration and I am happy if you scraplift or copy but would like to be acknowledged that I am the source. Father’s Day is just around the corner and I have managed to scrape some time together to get this idea out of my head. I have gained my inspiration from a visit to Wellington of the Hastings Rubber Stamp Shop and thought I might apply what I saw there with the CTMH products. I must admit that I did use a Memory Box die for the tools as there was nothing similar in the CTMH cartridges. While I try to use all CTMH products there are times where there is no substitute for what I want to achieve, however CTMH are relaxed about the use of other products but I would never use other papers, cardstock or stamps as I much prefer the quality of these products. Today I have used up some of my stash of the Timberline papers to create the effect of a door opening onto a cupboard containing tools for dad to use. I am apologise for the quality of the photos but it was dark and I really need to sort out a light box for me to photograph and also the card it self was difficult to photo as there was three different aspects to it. The outside of the card has been cut using the lovely woodgrain paper and I also lined the inside as the fishing paper did not fit in with what I wanted to achieve. I have cut the shapes out of Slate cardstock from the Artiste cartridge to create the effect of door hinges and a key opening. These have been distressed with Desert Sand ink to try and show an aged effect on the hardware. Here is a close up of the front and I have coloured Bitty Sparkles and a larger clear Sparkle with the black Twin Touch markers. I cut a piece of Colonial White cardstock at 4 x 5 1/4″ and stamped the saw image out of the You’re the Best stamp set in Desert Sand. 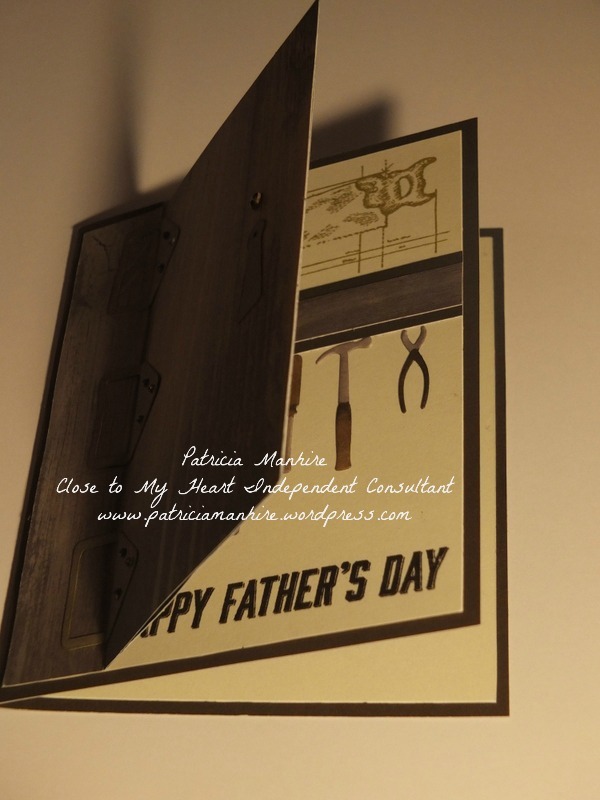 I then stamped the Happy Father’s Day stamp with Cocoa ink on the bottom of the card which was then adhered it to the front of the Cocoa card base which I cut out by hand. I trimmed some scrap cocoa cardstock and woodgrain paper to create the effect of a beam to hold the tools on. 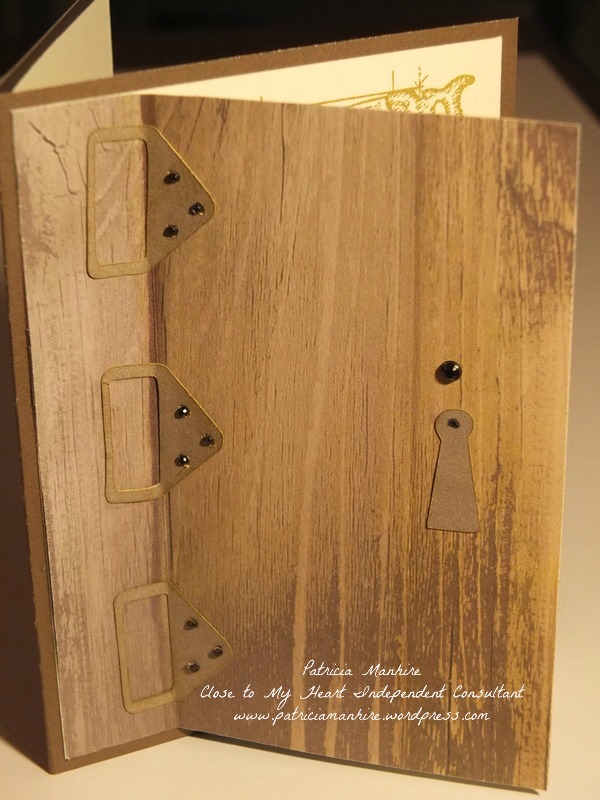 I used the Crafts Man Tools die from Memory box to cut the small tools out of Colonial cardstock which I then coloured with the lovely Twin Touch markers to create some dimension to them. I used the Bonding Memories glue stick to glue them to the card. Here is a close up of the inner part of the front of the card. I don’t normally do anything in the centre of cards but as I had used Cocoa cardstock for the base I had to do something for people to write on. 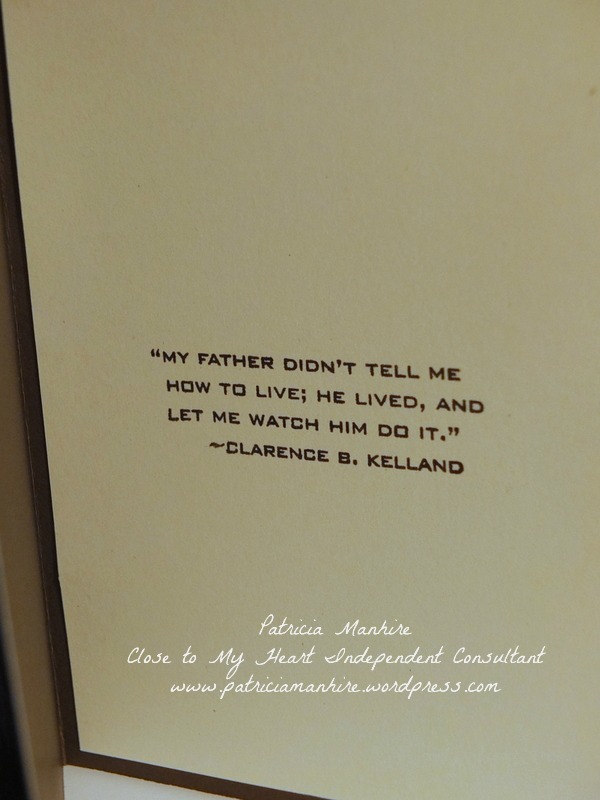 For the centre of the card I have cut another piece of Colonial White cardstock at 4 x 5 1/4″ and stamped the sentiment from the Your’e the Best stamp set and then adhered it onto the card. 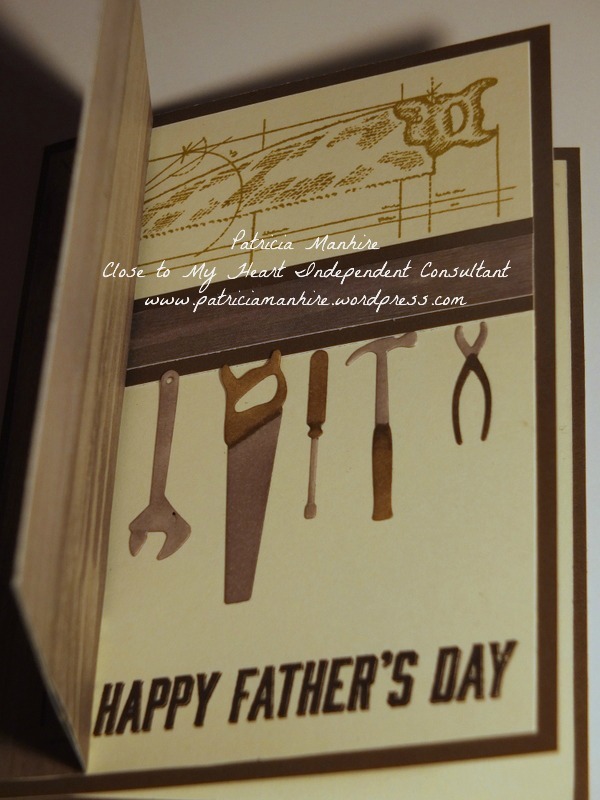 I am very happy that I have got this out of my head and now I can work on the current papers and stamps to create some more Father’s Day cards for sale at Gift Hutt. Just a quick note on the new adhesives from CTMH – they definitely have my seal of approval. There is the Duck adhesive and the 3L E-Z Dots Adhesive and both are very easy to use and economical. Adhesives – Bonding Memories Glue stick, 3L E-Z Dots adhesive.